Images courtesy of Michele Stapleton & Roger Leisner, the Maine Paparazzi. Legislators, it’s time to pass common sense gun laws. It’s time for universal background checks. It’s time to ban high capacity clips. It’s time to raise the minimum age for gun sales to 21. It’s time to ban assault weapons. And it’s time to dismantle the manipulative NRA. Take action while you still can, because if you don’t fit into this new world we are creating, believe me, we will vote you out." - Camden Hills Regional High School Sophomore Pearl Benjamin. Read Pearl's full speech here. in dress blues that would love to talk to you." U.S. Marine Corps combat veteran Omar Andrews and student at University of Southern Maine addressing the Gun Owners of Maine protesters in their orange "Guns Save Lives" t-shirts. LD 1761 will force K-12 schools in Maine to allow guns in school parking lots. For several decades, Maine law has included a strict prohibition against bringing guns to school. LD 1761 would erase the bright line that prohibits weapons on school property. As we have seen recently in Parkland FL and far too many other school shootings, keeping students safe from gun violence is challenging and allowing guns on school property will only make it more difficult for educators and law enforcement to keep our children safe. At the public hearing on LD 1761, the Maine Principals Assn., Maine School Boards Assn., and Maine School Superintendents Association all urged the Education Committee to vote against the bill. Lawmakers ought to listen carefully to those who are responsible for the safety of Maine students. Lewiston Superintendent Bill Webster explained to the Committee that once the school becomes aware of a firearm on or near school property, the immediate response is to contact the police and lockdown the school. If enacted, LD 1761 would lead to more police calls, more lockdowns, and more anxiety for students, staff and families. LD 1761 is being supported by the corporate gun lobby. The NRA has introduced bills in at least 23 other states to allow guns on school property this year. Their out-of-state lobbyists have traveled to Augusta to politically pressure legislators to support the bill. 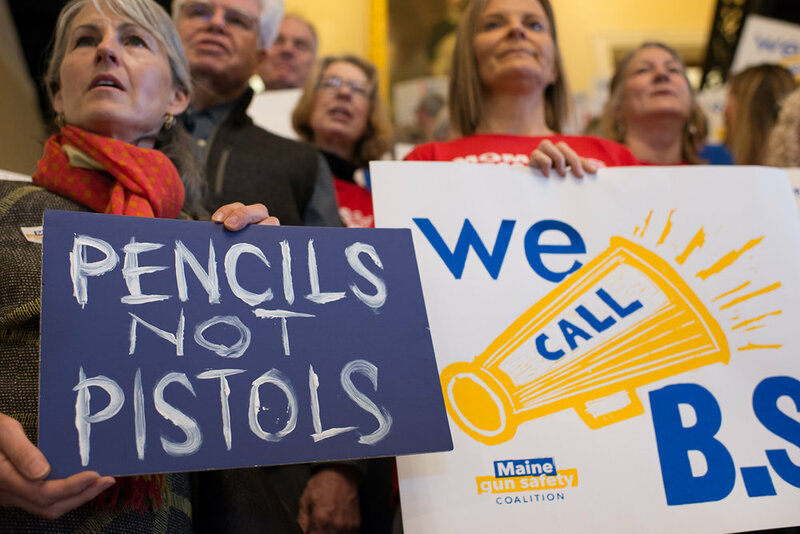 Lawmakers need to stand up to the gun lobby and take meaningful action to keep Maine’s children safe. "We believe that to protect students from unintended or intended harm there has to be a bright line. No guns on school property. Period.” - Steven Bailey, Maine School Boards Association and Maine School Superintendents Association. South Portland School Superintendent Ken Kunin said that he and South Portland Police Chief Ed Googins "both agree that the most troubling aspect of this law is that it prioritizes convenience over safety. We both agree we must maintain the very bright line that prohibits weapons on school property, not create unnecessary exceptions."